Track down the castle snatcher! The gnome princess has finally come home. She managed to make peace with the trolls and befriend their queen, but at home evil was afoot...A warlock collector stole the gnome monarch’s castle along with the royal family and now waits and hides in the Grey Wastelands! The princess must gather a team and set off on a new adventure to save her loved ones! 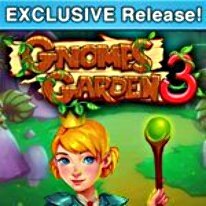 Set off with the gnome princess through uncharted lands full of mystery and unbelievable creatures in this exciting casual fantasy/strategy game, Gnomes Garden 3: The Thief of Castles. - Defeat the evil warlock and his army of gremlins and save your family and castle! - Over 40 levels that will keep you entertained for hours. - Challenging gameplay fit for all ages. - Obtain trophies for completing a variety of tasks.